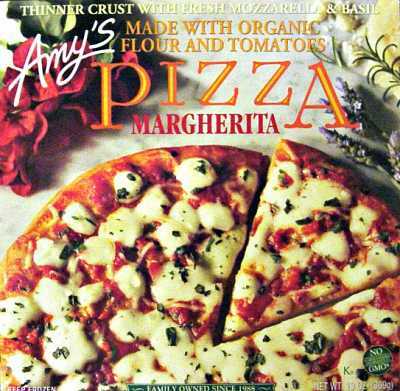 I recently purchased Amys Pizza from the freezer section of my local Fresh Market. I've tried Amy's burritos and wraps in the past and found them to be exceptionally tasty. For my introduction to Amy's pizza line, I chose the Pizza Margherita. What struck me was "Made With Organic Flour And Tomatoes" printed on the top of the box. And speaking of the box, doesn't it look like a work of art? A lovely color scheme complete with flowers and herbs! That alone enticed me to try it. Back to what I was saying; I am becoming a bit of a stickler for organic ingredients. Yes, they're more expensive, but they truly do taste better—in my humble opinion, that is! Most all of the ingredients listed on Amy's package were organic, including the tomatoes, flour, garlic, basil and extra virgin olive oil. No fillers or artificial ingredients, just the good stuff. And sea salt, another one of my favorite natural flavor enhancers! So, here's what it looks like when you take it out of the box. This pizza hardly looks frozen! The directions say you can cook it right on the oven rack, but I chose to bake it in a pan. 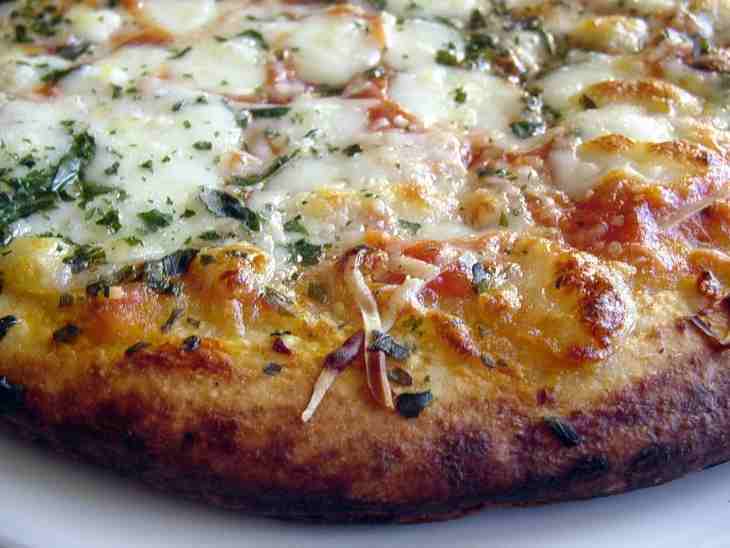 See those small strings and cubes of cheese that hug the outer rim of the crust? I just don't trust that they won't end up on the floor of my oven, so in the pan it goes. The texture is not quite as crispy when you bake a frozen pizza in a pan, but today I'm in the mood for a more gooey-dough crust, so to speak! A cheesy, gourmet delight! The crust came out perfectly—crispy on the edge with a soft center. And the flavor? Let's put it this way......the above slice didn't last very long! 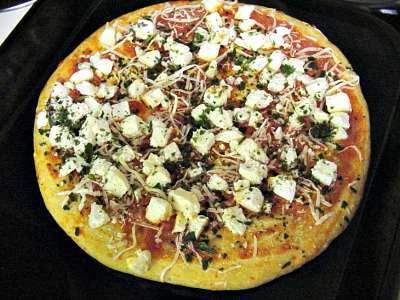 A mild, flavorful pizza bursting with the tantalizing delight that only comes from marrying the flavors of tomato and basil. I highly recommend Amy's pizza, and I am looking forward to trying their other combinations—roasted vegetable, spinach, mushroom and olive, Italiano and pesto—all made with crust variations from low-gluten to rice and the regular flour-based variety. Healthy, natural, organic, and most importantly.....delicious!! 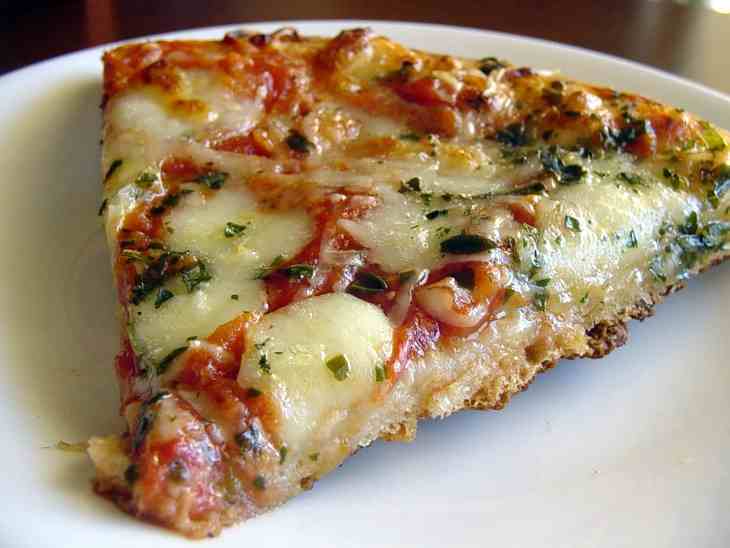 Sample GREAT pizza around the world! Click on the pizza below to find out more!! Copyright © 2009-2014 CompletelyPizza.com. All Rights Reserved.